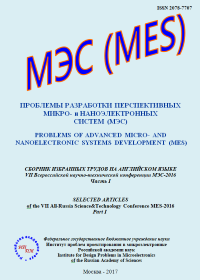 Proceedings of all-Russian scientific-technical conference MES «Problems of development of advanced micro and nanoelectronic systems» contains all presented reports and gives a general idea about the conference. The materials of the Proceedings reflect the state of the art of Russian micro- and nanoelectronics, methods and tools for the development of micro- and nanoelectronic circuits and systems and are an important source of information on promising areas of research and investment in the field of micro- and nanoelectronics. The presented works are performed by the scientific staff and graduate students of RAS, specialists working in the Russian scientific-production associations faculty, research staff, graduate students and students of higher educational institutions, and employees of several foreign companies leading in the field of designing micro- and nanoelectronic products. Proceedings is intended for scientists, specialists, postgraduates and students dealing with design, analysis, testing of complex micro- and nanoelectronic circuits and systems and related software tools. All proceedings papers are peer reviewed with subsequent approval by the Editorial Board of the proceedings. This MES Proceedings is included in HAC List (list 02.02.2016, item 1839) of Russian reviewed scientific journals, where should be published basic scientific results dissertations on competition of scientific degrees of doctor and candidate of Sciences, as well as in the database of Russian index of science citation (RISC). Theoretical aspects of design of micro and nanoelectronic systems (MES). Methods and tools for design automation of micro and nanoelectronic circuits and systems (VLSI CAD). Experience developing digital, analog, digital&analog, radio functional blocks of VLSI. Features design flow for nanometer technologies.